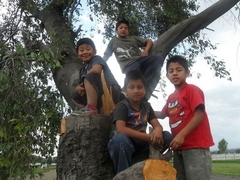 North Goshen Mennonite Church partners with a church planting effort in Mexico. To view the web site of the church in San Lucas, click here. To view more pictures of the San Lucas Church, click here. In 2008, our congregation began to partner with brothers and sisters in Christ in Mexico to bring the message of Jesus Christ to an area in the State of Puebla. 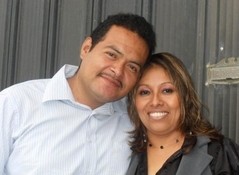 Today, Pastor Mario Lopez-Martinez, his wife, Carmen, and their family are living in San Martin Texmelucan, Puebla. They are reaching people with the good news of Jesus. North Goshen Mennonite Church supplies funds for this family to live and carry on their work. Each month, we send money to help pay expenses for the Lopez-Martinez family like school fees for their three children, food, and other necessities like medical care, transportation, and insurance. This allows the family to devote themselves to full-time ministry to their neighbors and friends who are hungry to learn about God. That God uses us as a couple to bless others as in the case of Adriana and her husband, who were our neighbors but have separated. We are praying for restoration. He has received Christ, and she listens to us but doesn't want to reconcile. She lives in San Lucas with her mother. That God blesses our children with grace, so that they bless other children in our neighborhood. That God continues to protect our son, Oliver, so that he can bless other young people, such as José, who came to our house to receive Christ because of a need in his life. He had a wound on his knee. We prayed for salvation and for his health. God gave him comfort, and he is encouraged about getting together. Other youth have shared with Oliver that they have hidden that they are Christians. That God puts in the hearts of those we have visited a strong desire to meet together. For the community of San Martin, that God break the preconceptions and unite the Christians. For the Friday night Bible study group that meets in San Lucas. The pastor and his wife also provide a children's club called "Ark of God" that meets every Saturday morning in a suburb of San Martin. 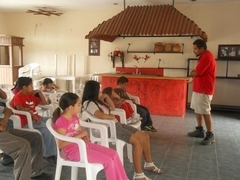 Neighborhood children come to the club to learn about Jesus while doing fun activities and art projects. Community evangelistic activities that Mario and Carmen have organized include "Afternoons of Reflection" during Holy Week, a special dinner for married couples in May, movie nights in June, and many others. Mario and Carmen are passionate about telling people about Jesus. We invite you to join us with your prayers for the continued support for their work in Mexico, a country that is Christian but in which few people know much about the Word of God. Through Mario's and Carmen's efforts, lives are being changed!